Pho bo is a Vietnamese beef and noodle soup which is often eaten for breakfast, but also makes a satisfying lunch or light dinner. The boiling stock, fragrant with spices and sauces, is poured over the noodles, bean sprouts and scallions, and it poaches the paper-thin slices of raw beef just before serving. SOAK the noodles in boiling water for 10 minutes. PLACE the stock, onion, ginger, hoisin and fish sauce, black pepper and five-spice powder in a saucepan. BRING to the boil, cover and simmer over a medium heat for 10 minutes. DRAIN the noodles and place equal amounts into two soup bowls. PLACE equal amounts of the sprouts, scallion and beef slices on top of the noodles. POUR over the boiling stock to cover and allow to stand for a minute to poach (ensuring the beef is immersed). 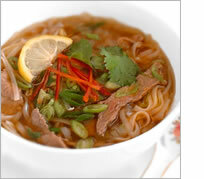 SERVE the soup drizzled with lemon juice and garnished with cilantro leaves and chili strips on top. Variations: Use thinly sliced firm tofu or smoked salmon instead of beef. Tips: To help cut the beef into paper-thin slices, place the meat in the freezer for about 30 minutes to firm up before slicing with a very sharp knife.